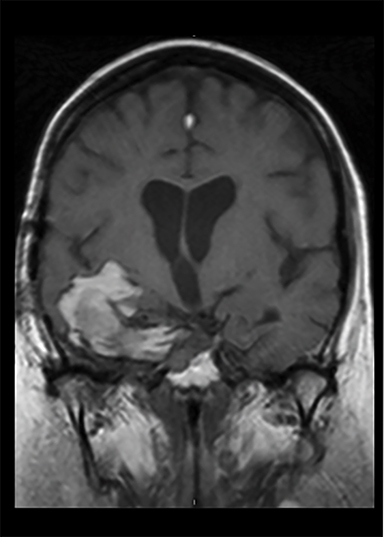 A 56-year-old female presented with acute-onset third cranial nerve palsy. Her history is significant for a pituitary macroadenoma (Figure 1A) treated with subtotal resection (STR) 6 years prior (Figure 1B). One year after STR, she developed progressive disease and underwent intensity-modulated radiotherapy (IMRT) (45 Gy/25 fractions). One month after completing chemoradiotherapy, repeat MRI demonstrated stable sellar disease with blood products in the right middle cranial fossa (Figure 3A). However, at this time she detected a right submandibular mass (Figure 3B). Biopsy was consistent with metastatic pituitary carcinoma and she underwent a resection of the right submandibular gland and lymph node. 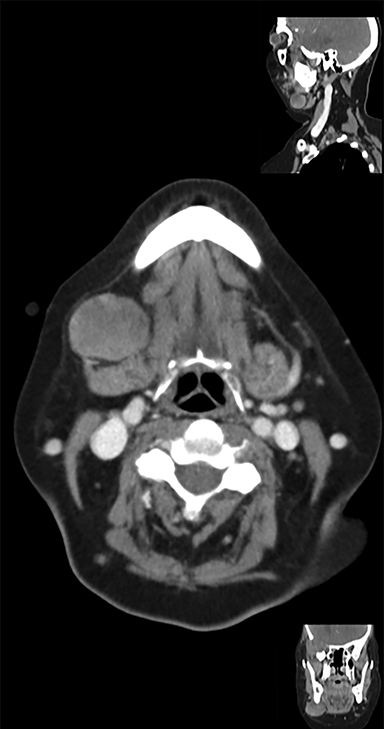 Three months later, she developed a right parotid mass (Figure 4A) requiring parotidectomy and supraomohyoid neck dissection, again consistent with metastasis. 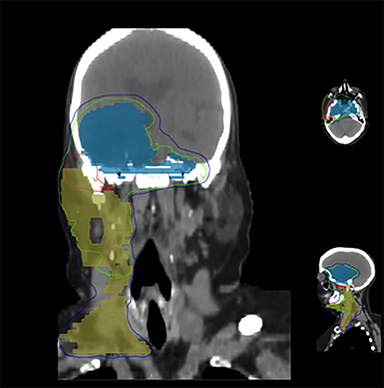 Postoperatively, she underwent unilateral neck IMRT (55 Gy/20 fractions) (Figure 4B) utilizing an accumulated dose plan (Figure 4C). Imaging of the submandibular mass demonstrated a heterogeneous, mildly enhancing 3.4 cm lymph node adjacent to the right submandibular gland (Figure 3B). 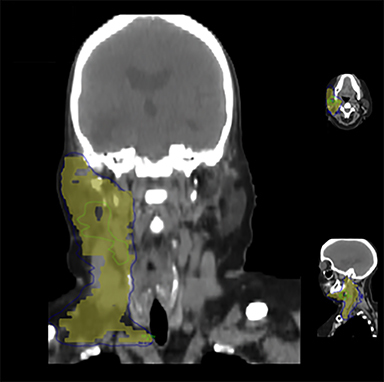 At the time of her parotid metastasis, CT of the neck demonstrated a 3.1 cm right parotid mass (Figure 4A) extending into the deep lobe of the parotid gland. Pituitary macroadenoma with malignant transformation to a pituitary carcinoma accompanied by right parotid and submandibular lymph node metastases. 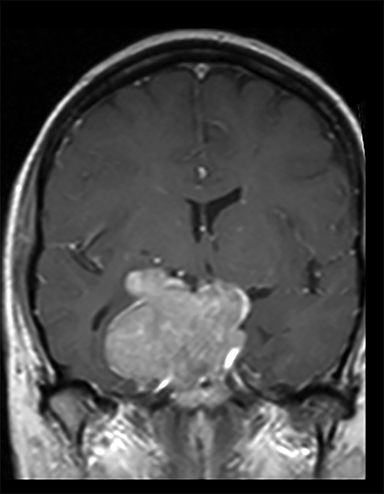 While pituitary adenomas are common benign tumors, they nevertheless may result in significant morbidity secondary to mass effect or secretory phenomena. Invasive adenomas, which account for 25-55% of adenomas, exhibit more aggressive and locally invasive behavior.3 Although the 2004 WHO classification of pituitary tumors is grounded in secretory products, a subset of “atypical” or “aggressive” invasive adenomas was also delineated.3,4 These adenomas are typically characterized by a high mitotic index, Ki-67 ≥ 3%, and extensive positive staining for p53. The significance of this delineation is apparent in the 2 proposed tumorigenesis models of pituitary carcinomas: the sequential and de novo models.4 While the first model reflects an adenoma-to-carcinoma sequence, the second suggests that aggressive adenomas form de novo with the potential for subsequent malignant transformation. In both models, the significance of the aggressive adenoma is paramount, as it represents the precursor lesion to pituitary carcinoma in the vast majority of cases. In the present report, pathologic data highlighted this challenge in distinguishing aggressive adenoma from carcinoma. Tissue from the first stage of repeat STR demonstrated a Ki-67 index focally in excess of 75%, with 15-20% staining with p53. In the second stage, Ki-67 index was 3-4% focally and p53 staining was < 5%. One month later, correlation with MRI demonstrated a heterogeneously enhancing mass suggestive of marked recurrence, followed shortly thereafter by clinically evident metastasis. 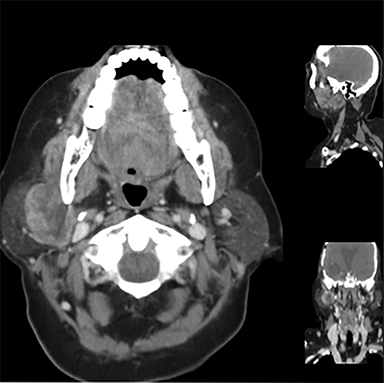 In this report, a 56-year-old female exhibited an adenoma-to-carcinoma tumorigenesis sequence with metastasis to submandibular lymph nodes and the parotid gland. While differentiating aggressive adenomas from carcinomas is challenging, certain clinicopathologic criteria may offer insight into the risk for malignant transformation. This differentiation is clinically significant, as a diagnosis of pituitary carcinoma confers a 5-year survival of 30%. Despite prognostic differences, both aggressive adenomas and pituitary carcinomas require multidisciplinary care. Emerging diagnostic and therapeutic technologies in the form of metabolic imaging and targeted therapies may provide additional benefit in the monitoring and treatment of these lesions. Raverot G, Sturm N, de Fraipont F, et al. Temozolomide treatment in aggressive pituitary tumors and pituitary carcinomas: a French multicenter experience. J Clin Endocrinol Metab. 2010;95(10):4592-4599. doi:10.1210/jc.2010-0644. Adkison JB, Tomé W, Seo S, et al. 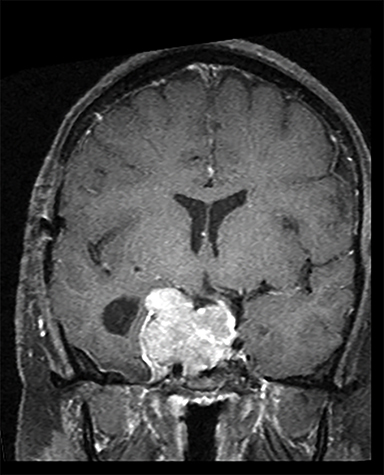 Reirradiation of large-volume recurrent glioma with pulsed reduced-dose-rate radiotherapy. Int J Radiat Oncol Biol Phys. 2011;79(3):835-841. doi:10.1016/j.ijrobp.2009.11.058. Chatzellis E, Alexandraki KI, Androulakis II, Kaltsas G. Aggressive pituitary tumors. Neuroendocrinology. 2015;101(2):87-104. doi:10.1159/000371806. Di Ieva A, Rotondo F, Syro LV et al. Aggressive pituitary adenomas—diagnosis and emerging treatments. Nat Rev Endocrinol. 2014;10(7):423-435. doi:10.1038/nrendo.2014.64. Heaney AP. 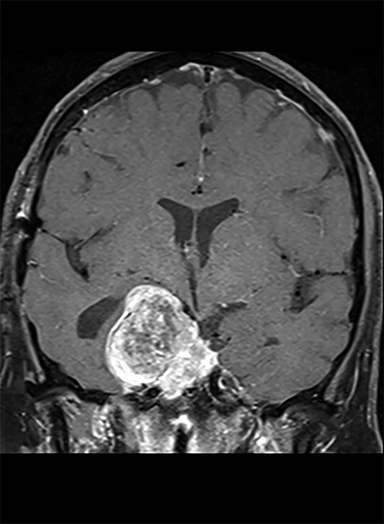 Clinical review: Pituitary carcinoma: difficult diagnosis and treatment. J Clin Endocrinol Metab. 2011;96(12):3649-3660. doi:10.1210/jc.2011-2031. Hansen TM, Batra S, Lim M, et al. Invasive adenoma and pituitary carcinoma: a SEER database analysis. Neurosurg Rev. 2014;37(2):279-285; discussion 285-286. doi:10.1007/s10143-014-0525-y. Ragel BT, Couldwell WT. Pituitary carcinoma: a review of the literature. Neurosurg Focus. 2004;16(4):E7. Pernicone PJ, Scheithauer BW, Sebo TJ, et al. Pituitary carcinoma: a clinicopathologic study of 15 cases. Cancer. 1997;79(4):804-812. Trouillas J, Roy P, Sturm N, et al. A new prognostic clinicopathological classification of pituitary adenomas: a multicentric case-control study of 410 patients with 8 years post-operative follow-up. Acta Neuropathol (Berl). 2013;126(1):123-135. doi:10.1007/s00401-013-1084-y. Zhao X, Xiao J, Xing B, et al. Comparison of (68)Ga DOTATATE to 18F-FDG uptake is useful in the differentiation of residual or recurrent pituitary adenoma from the remaining pituitary tissue after transsphenoidal adenomectomy. Clin Nucl Med. 2014;39(7):605-608. doi:10.1097/RLU.0000000000000457. Thapar K, Kovacs K, Scheithauer BW, et al. Proliferative activity and invasiveness among pituitary adenomas and carcinomas: an analysis using the MIB-1 antibody. Neurosurgery. 1996;38(1):99-106; discussion 106-107. Thapar K, Scheithauer BW, Kovacs K, et al. p53 expression in pituitary adenomas and carcinomas: correlation with invasiveness and tumor growth fractions. Neurosurgery. 1996;38(4):765-770; discussion 770-771. Suh JH, Chao ST, Weil RJ. Pituitary Tumors. Clinical Radiation Oncology. Vol 3rd ed. (Gunderson L, Tepper J, eds.). Churchill Livingstone; 2012. Müller K, Henke G, Compter I, et al. External validation of a prognostic model estimating the survival of patients with recurrent high-grade gliomas after reirradiation. Pract Radiat Oncol. 2015;5(3):e143-150. doi:10.1016/j.prro.2014.10.001. Bush ZM, Longtine JA, Cunningham T, et al. Temozolomide treatment for aggressive pituitary tumors: correlation of clinical outcome with O(6)-methylguanine methyltransferase (MGMT) promoter methylation and expression. J Clin Endocrinol Metab. 2010;95(11):E280-290. doi:10.1210/jc.2010-0441. Hegi ME, Diserens A-C, Gorlia T, et al. MGMT gene silencing and benefit from temozolomide in glioblastoma. N Engl J Med. 2005;352(10):997-1003. doi:10.1056/NEJMoa043331. Presentation of pituitary carcinoma as neck metastasis after irradiation of recurrent pituitary macroadenoma. Appl Rad Oncol. Prepared by Mr. Miller, a medical student at Cleveland Clinic Lerner College of Medicine, Case Western Reserve University, Cleveland, OH; Drs. Balagamwala and Oh, Resident Physicians; Dr. Koyfman, Assistant Professor; and Dr. Suh, Chairman, Department of Radiation Oncology, Cleveland Clinic, Cleveland, OH.